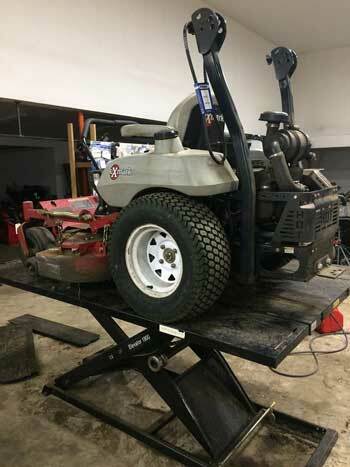 Part 2: Jeff at One Pull Lawnmower Shares more pics of Zero Turn Mower on the Lift! Jeff at One Pull Lawnmower shared some more pics of his lift in action with an awesome lawnmower. He tells us the lift, "Works great for all my commercial customers." These are some great pics Jeff shared with us of an Exmark Lazer Z HPZero Turn Mower up on the Elevator 1800 Mower Lift Table.